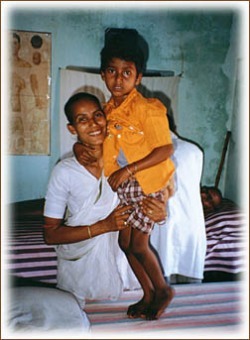 Our Sister Clinic Program The free clinic at Ananda Nagar sees 40 to 60 patients daily. Currently the entire clinic is supported by the donations generated from two small Acupuncture clinics in rural Vermont where patients accept a two dollar increase to their fee, which is donated to our program. This is serving as the model for our Sister Clinic Support Program. As a practitioner we invite you to participate as a Sister Clinic, to help raise operating funds for the Institute. As a patient we encourage you to share this information with your practitioner, along with your desire to volunteer financial assistance to our program. A monthly, yearly or one-time donation is another way to show your support and help us meet our needs for space, supplies and equipment so that we can continue to provide quality care and training. The AIAN is a registered 501(c)3 organization, your donation is tax deductible. We rely on compassionate donations, and we have received support from a growing number of businesses in the form of books for our library, leftover samples and outdated disposable needles. A sterilizer at cost was a treat beyond belief! Our needs are great: books, equipment to expose the student to all that Acupuncture can offer, are never-ending. We have also been getting much support from the Acupuncture Symposia, which pass along information about our work. And then there are people met on a train who want to know your story, and they give. It is not about the amount but the willingness to share whatever good fortune you find your way with others. Lastly, our patients who can afford some type of payment will volunteer something, usually in the amount of five, ten, fifteen cents (and to them that is a huge amount of money).